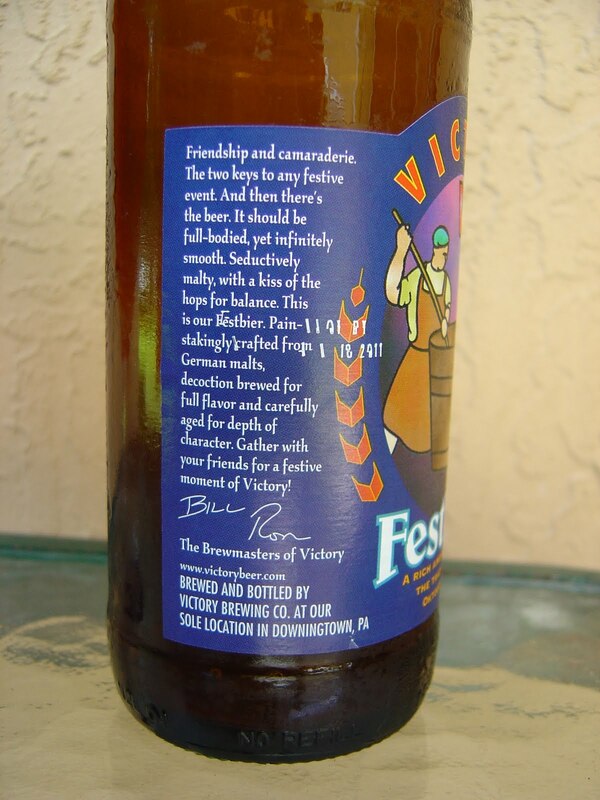 I recently grabbed a bottle of Victory Brewing's Swing Session Saison. This one was brewed at their Downingtown, PA location, but noticeably missing on the label was the phrase "our sole location", like this one. That brag was cool before success and expansion, I guess. The label is pretty plain, with just the name of the beer over an impressionistic background of oranges and lemons (I think). The side defines "swing" and ties it to the beer and style and what they were after when they crafted this brew. Lemony aroma with a little zing, spicy coriander and orange peel. The lemon flavors were a bit sharper than I was anticipating but welcome and grow on you after a few sips. Yeasty and tangy from the beginning. There is also plenty of coriander to go around, start to finish. Swing has a light funkiness and has a thicker than expected texture despite maintaining a light-to medium body. Good carbonation, dry at the finish. The 4.5% alcohol was not a factor, easily a session beer. Refreshing. Check it out. Wow. Didn't know Victory brews could be found in Florida. Interesting. Have to find this one for myself. Had Helios Ale in November. Very spicy and peppery, too. Yep, for a few years now we get their beers. They make some of my favorites.